, Chief Operating Officer of Capalino + Company, presents Friends of the QueensWay with Marc Matsil, Director of The Trust for Public Lands, during MAS short talk series. 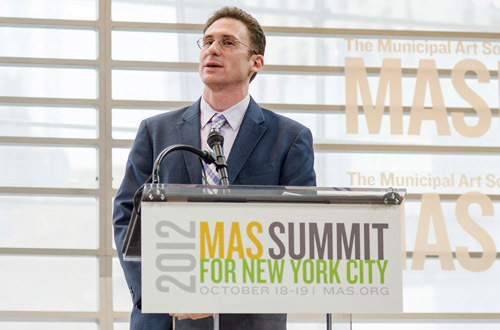 On October 18 and 19 at Jazz at Lincoln Center’s Frederick P. Rose Hall, more than 1,100 innovative city shapers and thought leaders gathered as the Municipal Art Society presented the third annual MAS Summit for New York City. This forum of ideas surrounding planning, design and infrastructure; preservation and sustainability; arts and cultural development, and community engagement featured more than 90 speakers over the two days and highlighted trailblazing initiatives in New York and other cities across the globe. To maintain its stature as one of the world’s great global cities, New York City must continue to cultivate opportunity and nurture innovation in all spheres. This year’s Summit themes—Development, Density and Diversity—explored the balancing act of users and uses and the challenge of building a globally competitive city that is socially, economically and environmentally resilient—and livable—for all New Yorkers.